Archeologists have dated the disc to 1600 B.C. 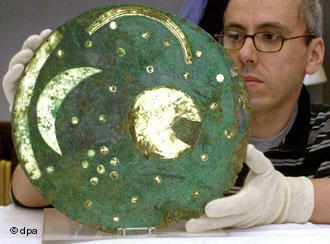 The Nebra sky disk is associatively dated to c. 1600 BC and attributed to a site at Nebra, Saxony-Anhalt in Germany. It is a bronze disk of around 30cm diameter, patinated blue-green and inlaid with gold symbols interpreted by some as a sun or full moon, stars (including a cluster interpreted as the Pleiades) and a crescent with multiple strokes, interpreted as a sun boat with many oars. It has been associated with the Bronze Age Unetice culture. If authentic, the find sheds new light on the astronomical knowledge and abilities of the people of the European Bronze Age, such as the builders of Stonehenge. Judging from the angles set by gilded arcs along the sky disk's circumference, it may be that the Bronze Age cultures in Central Europe made far more sophisticated celestial measurements far earlier than has been suspected. The object is not without controversy. Richard Harrison, professor of European prehistory at the University of Bristol and an expert on the Beaker people allowed his initial reaction to be quoted in a BBC documentary. Though Harrison had not seen the skydisk when he was interviewed, it was a reasonable skepticism at that point. The disk had appeared as if from nowhere on the international antiquities market in 2001. Its seller claimed that it had been looted by illegal treasure hunters with a metal detector in 1999. Archaeological artifacts are the property of the state in Saxony-Anhalt and following a police sting operation in Basel, Switzerland, the disk was acquired by the state archaeologist, Dr Wolfhard Schlosser. As part of a plea bargain, the illicit owners led police and archaeologists to the site where they had found it together with other remains (two bronze swords, two hatchets, a chisel and fragments of spiral bracelets). Though no witnesses were present at the first discovery, archaeologists have opened a dig at the site and have uncovered evidence that support the looters' claim (in the form of traces of bronze artefacts in the ground). The disk and its accompanying finds are now in the Landesmuseum fŸr Vorgeschichte (State Museum for Prehistory) of Saxony-Anhalt, Germany. The discovery site identified by the arrested metal detectorists is a prehistoric enclosure encircling the top of a hill. Strikingly, the hill is still called the Mittelberg ('Central Hill'), a 252m hill in the Ziegelroda Forest, 180km southwest of Berlin. The enclosure is oriented in such a way that the sun seems to set every equinox behind the Brocken, the highest peak of the Harz mountains. The nearby forest is said to contain around 1,000 barrows. It was claimed by the treasure-hunters that the artifacts were discovered within a pit inside the bank-and-ditch enclosure. As the item was not excavated using archaeological methods, even its claimed provenance may be made up, authenticating it has depended on microphotography of the corrosion crystals (see link), which produced images that could not be reproduced by a faker - and which, incidentally, are very beautiful scientific micrographs in themselves. The more precise dating of the Nebra skydisk, however, depended upon the dating of a number of Bronze Age weapons which were offered for sale with the disk and said to be from the same site. These axes and swords can be typologically dated to the mid 2nd millennium BC (Unetice culture). Those who have examined the disk point out that its patina indicates the disk's antiquity, and the interested reader may want to look at the micrographs in the article linked below and assess whether such effects could be produced chemically by a counterfeiter. One skeptic has suggested parallels with the controversy surrounding the Shroud of Turin. According to an analysis of trace elements by x-ray fluorescence by E. Pernicka, University of Freiberg, the copper originated at the Mitterberg in Austria, while the gold is from the Carpathian Mountains. Copper from Bottendorf in the immediate vicinity of Nebra has definitely not been used. But few copper objects are found where they were originally smelted. If the disk is authentic then it may be argued that quantitative astronomy in central Europe may possibly date back 3,600 years. Egyptian representations of the sky are purely schematic at this time. The lack of a secure archaeological context for the disk however, means that it is difficult to accurately date or even authenticate it. It is unlike any known artistic style from the period and has been described as a fake by some archaeologists. Possibly a scientific instrument as well as an item of religious significance, the disk is a beautiful object; the blue-green patina of the bronze may have been an intentional part of the original artifact. The disk has only just begun to attract the kind of pseudoarchaeology, Wiccan and paranormal speculation that hangs over Stonehenge. Recently, its authenticity has again been attacked by the archaeologist Prof. Peter Schauer, university of Regensburg, who interprets it as a shaman drum of unknown, but late, date. Near the dig city, in 23 km distance the Goseck circle was discovered. It is a solar observatory built ca 4900 BCE.